For all of our office's responses to the Governor's May Revision, see our May Revision page here. This analysis describes the major features of the Governor’s May Revision and provides our comments on the Governor’s overall budget proposal. Unlike prior years in which we produced an Overview of the May Revision publication, this year we plan to release our assessment of the Governor’s May Revision in various products that will be found on our website. LAO Revenue Estimates Are Higher. Within the next few days, we plan to release our multiyear budget outlook that will reflect our assessment of the Governor’s revenue and spending estimates. As described here, our revenue estimates are a few billion dollars higher than the administration’s new estimates for the 2015-16 fiscal year. Our initial calculations suggest that most of these higher revenues will be consumed by higher spending requirements for schools and community colleges under Proposition 98 and higher budget reserve and debt payment requirements under Proposition 2. Our revenue estimates would, however, leave the Legislature with more money for additional reserves, debt payments, or new budget commitments. These are rough, initial calculations and are subject to change (if, for example, we identify other issues with the administration’s budget projections). We will post more details concerning our estimates as they are finalized in the coming days. Ends 2015-16 With $4.6 Billion in Total Reserves. 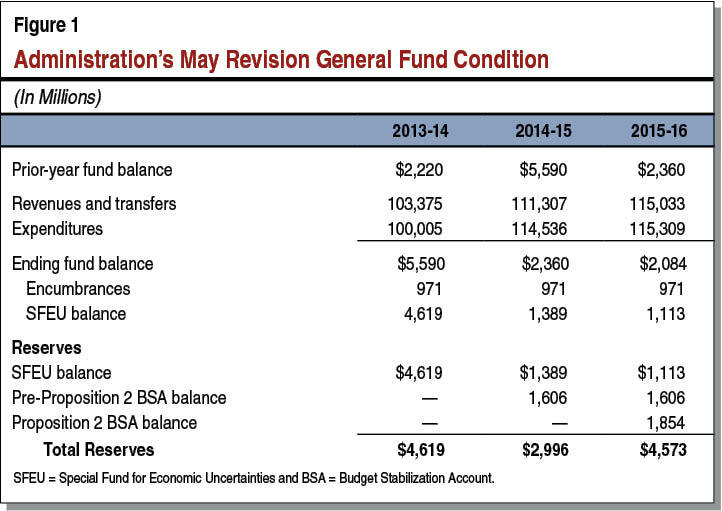 Figure 1 shows the administration’s estimated General Fund condition as of May 2015. (See page 10 of the May Revision summary for the administration’s version of this table.) We display the overall condition of the budget somewhat differently than the administration. Most importantly, we sum the ending balance in the Special Fund for Economic Uncertainties (SFEU)—the state’s traditional budget reserve—and the Budget Stabilization Account (BSA) because we think this total is a better reflection of the state’s budget reserves. In addition, we display two different BSA balances because there is a strong argument that the Legislature could appropriate the $1.6 billion of pre–Proposition 2 BSA balances at any time, whereas the Governor would have to declare a budget emergency before the Legislature could access BSA funds deposited after passage of Proposition 2. In total, under the Governor’s plan and the administration’s revenue and spending estimates, state reserves end 2014-15 at $3.0 billion and climb to $4.6 billion at the end of 2015-16. This essentially means the state would have a $1.6 billion “operating surplus” in 2015-16, thereby growing reserves by this amount. Figure 2 lists some features of the May Revision’s General Fund estimates. (Outside of the General Fund, the Governor’s major proposals include a significantly larger cap-and-trade spending plan and a drought package financed largely by bond funds.) The administration estimates that General Fund revenues are now $6.7 billion higher than that reflected in the January Governor’s Budget for 2013-14, 2014-15, and 2015-16 combined. Revenues are actually estimated to be $380 million higher than the $6.7 billion figure, but the administration is proposing a state earned income tax credit (EITC) program, which would reduce General Fund revenues by a like amount. These higher revenues, however, are mostly offset by $5.5 billion in higher General Fund spending on Proposition 98. 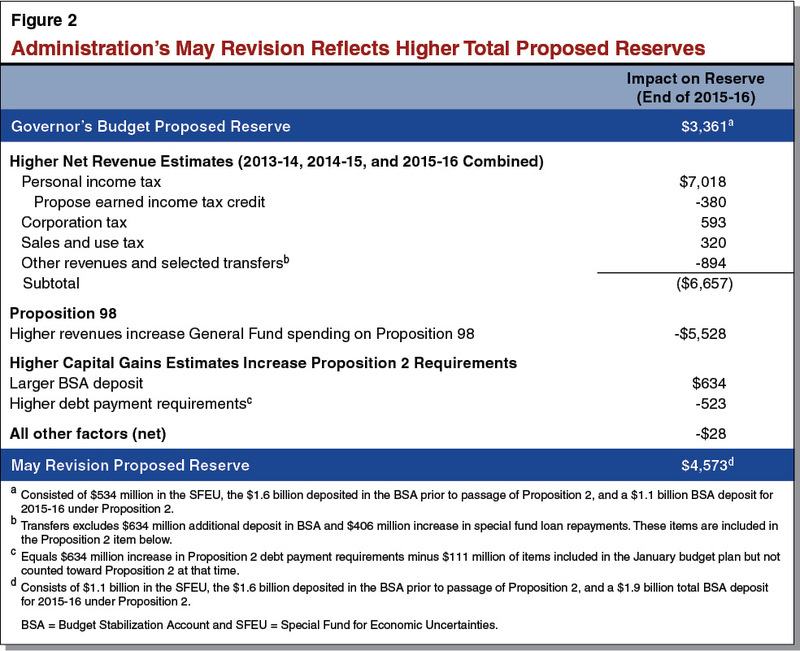 In addition, the administration’s higher estimate of capital gains taxes drives up Proposition 2 requirements, with the BSA deposit increasing reserves and the debt payments decreasing total reserves. After accounting for other minor factors, total reserves proposed for the end of 2015-16 grow from $3.4 billion in the Governor’s January plan to $4.6 billion in the May Revision. Below, we walk through the categories displayed in the table. Revenues Up $6.7 Billion (Net) Over January 2015 Estimates. The May Revision reflects a $6.7 billion higher revenue forecast across 2013-14, 2014-15, and 2015-16 combined. This total consists of $7.0 billion higher personal income tax (PIT) revenues—offset by the $380 million EITC proposal described below—$593 million higher corporation tax revenues, and $320 million higher sales and use tax revenues. In addition, the administration estimates that the state’s numerous smaller General Fund revenues and non-Proposition 2 related transfers are down by $894 million over the three fiscal years combined. Very Large Share of Higher Revenues Goes to Proposition 98 Spending. The administration has revised its estimates of the Proposition 98 minimum guarantee for 2013-14, 2014-15, and 2015-16 upward by a combined $6.1 billion. Of this amount, $5.5 billion comes from the state General Fund and the remaining $556 million comes from local property tax revenues. The General Fund increase accounts for a very large share (83 percent) of the higher revenues the administration identifies in the May Revision. (To derive this share, we excluded revenues that do not apply to the Proposition 98 calculations.) The Governor’s revised spending plan dedicates the additional $6.1 billion toward two main areas—reducing the K-14 mandate backlog ($2.8 billion) and accelerating implementation of the Local Control Funding Formula ($2.1 billion), with about $700 million spread across various other new initiatives and $450 million for various technical adjustments (mostly associated with changes in student attendance). Higher Capital Gains Estimates Increase Proposition 2 Requirements. The administration’s May Revision estimate for Proposition 2 is up $1.3 billion, largely due to the administration’s higher estimates of capital gains taxes for 2015-16. This results in a $634 million higher deposit in the BSA—bringing the total 2015-16 deposit to $1.9 billion. Moreover, an additional $634 million must be spent on existing state debts. The administration meets this higher requirement by proposing an increase in special fund loan repayments of $406 million and a $96 million contribution to the University of California (UC) pension plan. In addition, the administration counts two items toward meeting Proposition 2 requirements that were included in its January budget plan but were not counted toward Proposition 2 at that time. Specifically, the administration counts $47 million in special fund loan interest and the final $84 million payment related to Proposition 42. Counting these latter two items made it easier for the administration to meet a larger Proposition 2 debt payment requirement. Similarly, the administration’s proposal to assist the UC with its pension costs allowed the administration to propose additional funding for the UC that was required to be used for Proposition 2 purposes in any event. Other Changes. The administration’s May Revision spending estimates reflect hundreds of millions of dollars of savings in HHS and several other programs. For example, the federal government recently approved a higher matching rate for the federal Children’s Health Insurance Program. The administration estimates that this will reduce state General Fund Medi-Cal costs by $381 million. These savings, however, are offset by higher costs in other areas of the budget. For example, the cost of the “trigger” included in the June 2014 budget plan increased from $533 million to $765 million, thereby paying down the remaining pre-2004 mandates owed to cities, counties, and local governments for their past mandate costs. Governor Made Over $1 Billion of Discretionary General Fund Budget Decisions. After satisfying Proposition 98 and Proposition 2 requirements, the administration’s higher revenue estimates left around $400 million of General Fund resources for other priorities. In addition, the May Revision reflects hundreds of millions of dollars in net General Fund savings in HHS programs, debt service, prisons, and the Cal Grant program, among others. These savings were key to providing the Governor with resources to fund his May Revision priorities. The Governor’s priorities for these discretionary funds included: (1) growing the SFEU reserve balance by almost $600 million, (2) committing $380 million per year to an EITC on an ongoing basis, (3) providing over $100 million to the universities, and (4) spending tens of millions from the General Fund related to the drought package. Revenue Growth Could Quickly Be Reversed. As has been widely discussed in recent years, the state has a very volatile revenue system. For example, compared with assumptions in last year’s budget, the administration’s estimates of PIT revenues for 2013-14 through 2015-16 are now over $9 billion higher. We are clearly on the upward slope of the state’s revenue roller coaster. But just as the state’s revenue picture has improved significantly over just a few months, it can just as easily reverse course with a stock market or economic downturn. There is little indication that such a downturn will occur soon, but as we discussed in our November Fiscal Outlook, such slumps can occur with little warning. Restraint in approving new ongoing programs is key to preventing an unsustainable spending base. More spending now generally means that the state’s elected leaders will face more difficult budgetary decisions in the future when downturns emerge. In addition, resolve in building a large budget reserve is key to blunting the effects of sharp revenue declines. Proposition 2 aims to build such a reserve over the long run. With only $3.5 billion in the BSA at the end of 2015-16, however, the state has a long way to go to realize the roughly $12 billion goal approved by voters in Proposition 2. State’s Capacity for Ongoing Spending Even Less Clear Than Before. We are often asked to estimate the amount of new budget commitments that can be sustained by the General Fund revenue base. For many years now, we have had no way of answering this question with any degree of precision. This has been primarily due to revenue volatility and the state’s complex education funding formula. This difficult task is now compounded by uncertainty imposed by Proposition 2—the budget reserve and debt payment formula approved by the voters in November 2014. The state budget is now more complex than ever before. Because Proposition 2 and Proposition 98 depend heavily on variables that cannot be reliably modeled into the future, estimates of future state budget surpluses or deficits should be viewed with caution. Moreover, the introduction of Proposition 2’s “true ups” next year will render multiyear budget outlooks even less useful. In light of these challenges, we suggest that the Legislature tread carefully in authorizing new spending commitments or tax reductions. Possible Effects of LAO Revenue Estimates. Our revenue estimates are a few billion dollars higher than the administration’s estimates. It appears that while most of those revenues would go to Proposition 98 and Proposition 2, there would be some money available for discretionary programs. (As noted above, we will release more details on our overall budget estimates in the coming days.) Setting aside money in reserves, such as the funds set aside by Proposition 2, is key to building a more durable state budget for the inevitable next downturn. If the Legislature adopts our revenue estimates, we advise caution in committing to new ongoing spending programs or tax reductions. LAO Contacts: Ryan Miller and Jason Sisney. For other LAO staff contact information, go to www.lao.ca.gov/Staff. Updated May 17, 2015 with minor changes and links to LAO revenue outlook.